Ryan Deakin prepares to make contact with an opponent. The sophomore won easily Sunday but not against the opponent he expected. 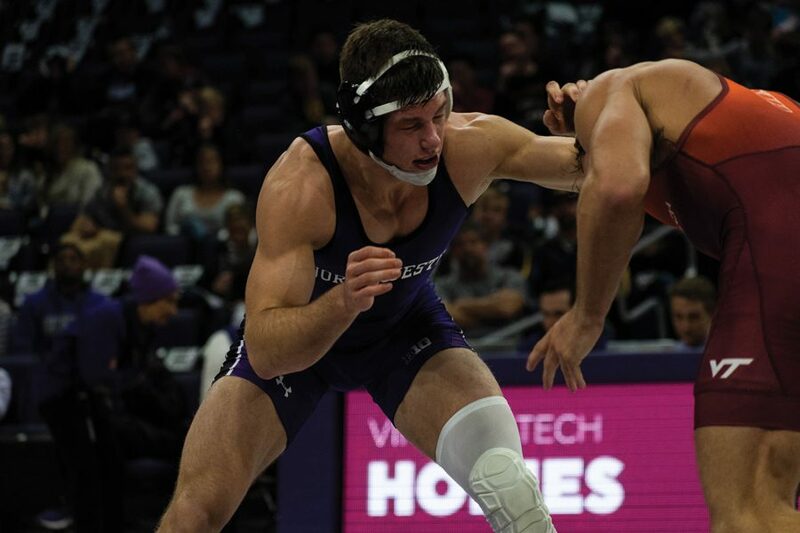 Northwestern has wins against ranked Virginia Tech and Wisconsin teams this season but has struggled against teams in the upper echelon of the Big Ten, easily the nation’s best wrestling conference. That trend continued Sunday against No. 4 Iowa (10-0, 5-0 Big Ten), as the Wildcats’ only wins came from their two wrestlers ranked in the top five in their respective weight classes. Sophomores Sebastian Rivera and Ryan Deakin won their bouts at 125 and 157 pounds, respectively, but NU (3-7, 1-4) was otherwise kept off the scoreboard and fell to the Hawkeyes, 32-7. The match started well for the Cats, as Rivera defeated Iowa’s Perez Perez by major decision, 11-1. Rivera is ranked No. 1 nationally in his weight class, and he was originally scheduled to take on the No. 2 wrestler, Spencer Lee. However, Iowa rested Lee by coach’s decision and Perez took his place. After a slow start, Rivera won easily to give NU a 4-0 lead. Rivera improved to 18-0 for the season, including a win over Lee at the Ken Kraft Midlands Championships in December. After Rivera’s win, Iowa won the next three bouts to take a 10-4 lead in the match. The Cats nearly picked up a victory at 149 pounds as freshman Yahya Thomas took Iowa’s No. 13 Pat Lugo into overtime. But Lugo outlasted Thomas 2-1, which put NU in a big hole. Deakin, ranked No. 3 in his class, gave the Cats another win just before intermission, beating the Hawkeyes’ Jeren Glosser 6-1 at 157 pounds. Like Rivera, Deakin thought he would be up against a highly-ranked wrestler, but No. 5 Kaleb Young did not compete and Deakin took advantage of his lesser opponent. Also like Rivera, Deakin defeated Young at Midlands to secure a title. The Colorado native is now 19-2 on the year. Deakin’s win was the last of the day for NU. Junior Zack Chakonis, who came in just 3-12 this season, came closest at 197 pounds against Iowa’s No. 5 Jacob Warner, but wound up losing 4-2. The schedule does not get any easier for the Cats, who host No. 2 Ohio State next on Feb. 3.